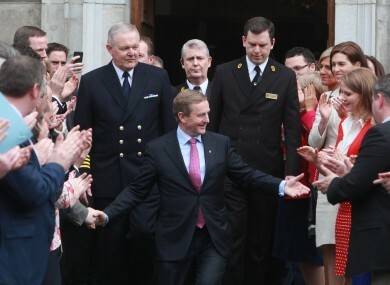 And you, and you, and you: Taoiseach Enda Kenny's new government is promising equality and fairness for all. THE NEW PROGRAMME for (partnership) government has just been published – and its key vow is to create a more equal and fair society. The backlash to the election campaign slogan favoured by Fine Gael, the linchpin in this minority-led new government, has obviously been noted. Out goes ‘Keep the Recovery Going’; in comes a promise to put a fair society first, enabled by the building of a strong economy. ‘A Fairer Ireland’ is the new catchphrase and the word ’fairness’, or derivatives thereof, appear no fewer than 41 times over this 153-page document. The ‘Programme for a Partnership Government’ commits to what it calls a ‘Social Economy’. TheJournal.ie team has parsed the 16 chapters of the document to bring you analysis of the key new promises (and how they might hope to keep them). The whole Programme for a Partnership Government is available to view for yourself here. The vow: To reduce the percentage of patients waiting longer than six hours in emergency departments from 32% today to 7% by 2021. They are also vowing to cut waiting times for appointments, surgeries and tests across the entire health service. All of these vows have a long-range deadline for delivery of success, which on the face of it implies that this government intends to see the distance in office, despite its delicate make-up. Email “Fair play? New programme for government is promising equality for all”. Feedback on “Fair play? New programme for government is promising equality for all”.